I love this school and I graduated from here with an MBA. Since January 2000 I had been going school for 2 nights a week at Brooklyn College to finish for my degree in business. So going to school 2 nights a week to learn something new became an ingrained part of my life. I decided to focus on business and finance because the purchasing function and negotiating price, performace and delivery of criticals parts, was always a big part of my job. I knew I was going to be Graduating from Brooklyn College in June 2005 and I knew I would feel like a fish out of water with no school to go to. I enjoyed my time at Brooklyn College so I wanted to stay within the CUNY school system. This left Baruch as my first and only choice of MBA School. 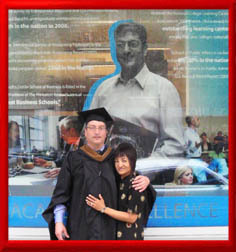 In October 2005 I took the GMAT test and applied to Baruch and was accepted. I started there in January 2006. You can read how I did it in the Baruch Entry Process section.